We’ve gathered a few tips and tricks to getting the best deal on a boat near and far away from your location, so let’s get to it. Easy tip: Don’t buy a boat from Florida after a major storm. Their supply will be dismal, and any boats on the market will have sustained major damage. If you’re in a city like Charleston SC the prices may be up and down, but you have the luxury of being on a coast. You can look to other coastal cities like Myrtle Beach, Savannah GA, Virginia beach NC, Jacksonville FL, and the New England area. Boating culture in areas like Annapolis, MD, and the Chesapeake Bay drive supply up, which in turn drive prices down. You may have to get your boat shipped to you, but that could beat out the price of a closer boat of the same make and model. If you live in a state like Michigan, the economic climate may make for a buyer’s market but since there aren’t a large boat culture (like in Chicago or Green Bay Wisconsin) prices will still be high. Check out your neighbors to the South (like Indiana and Ohio) and across the Lake to see what kind of prices they are offering, they may have a deal. The West coast even has it’s major boating hubs. If you live in Seattle consider looking at cities as far away as San Francisco and San Diego for a good deal. 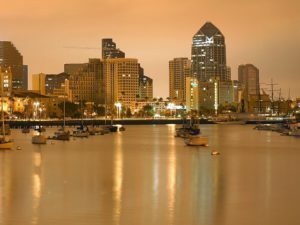 San Diego is a major hub for boats and boating culture. What we’re trying to say here: Shop around in different geographical areas near you. If you get your amazing boat and it turns out to be less than amazing, don’t suffer through it! Boats can be a huge money pit and a drain on your psyche. Why make yourself go through that! Sell that old boat and use the money to buy a better one! But where can you sell your old boat? We are in the business of buying old and used boats for cash. Simply fill out our free online quote form and we’ll give you a price. If you like what you see, we’ll take care of the rest! So don’t suffer with a boat you hate, let us here at SellUsYourBoat.net buy it off you!